lessons // 13 tips for blog conferences. 1. going alone is encouraged. you’ll be forced to step out of your comfort zone + you’ll realize just how rewarding that is. 2. find the fine line between living in the moment + hiding behind your camera lens. be present, but document as you see fit. returning home wishing you had snapped more photos is a rotten feeling. 3. collect business cards like candy. it’s impossible to remember everyone you had the pleasure of meeting, plus they serve as a pretty souvenir. 4. stay hydrated. coffee, champagne, & water are all viable options. 5. be a sponge. how often do you have the opportunity to learn from, be inspired by, and socialize with your peers fellow bloggers? pick everyone’s brain. you’ll be amazed what you can learn. 6. introduce yourself by your name + blog title. [c/o cedar and rush‘s presentation]. be your own biggest advocate. 7. take entirely too many notes. 8. create a plan of action, from said notes. and most importantly, follow through. 9. have a brainstorming session. you’re riding on a wave of motivation. take full advantage & write down every idea that your head can possibly produce. 10. make sure everyone you had the pleasure of meeting knows it was a true pleasure. 11. blogging is a community. support each other. 12. wear flats. the comfiest of heels are no match for an entire day, regardless of the stand-up to sit down ratio. 13. be genuine. make your blog a true reflection of yourself. and last but not least, attend as many as you possibly can. they are truly beneficial. [in my opinion, these tips can be slightly modified to fit any professional development event]. to new adventures, on a rainy day. we’ve made it to the middle of the week. little victories. and I have a happy story. my favorite sweet treat at starbucks is the banana chocolate chip coffee cake. it’s decadent and amazing. well, a couple weeks ago I decided to splurge and order a slice. the barista [via the drive thru] informed me they didn’t carry it any longer. I don’t know if that’s true for all stores, but I was crushed. with coffee cake still on the brain. preface: I don’t bake! I loved to help my grandma as a little girl. but as an adult, I’m just afraid. well starbucks gave me no choice. so yesterday, I took to the kitchen ..with fear & a lot of hope. why I’ll never be a “baker”: my kitchen never has butter. never. as I was beginning my coffee cake, I was on the phone with my mom ..and when I told her I was missing a key ingredient [butter]. she laughed. and announced it wasn’t possible without. well folks, I made a scrumptious coffee cake with NO butter. and I called my mom after my first bite to announce my victory! 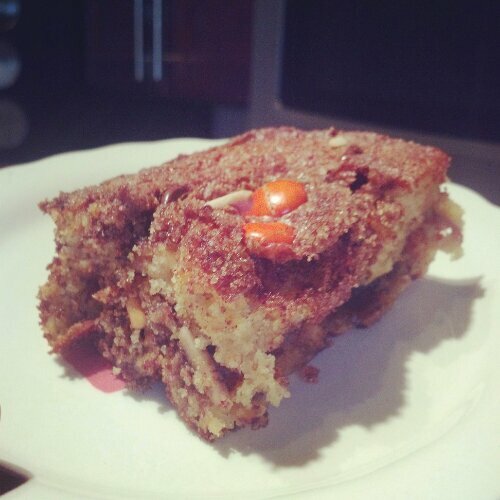 I am so happy with my delicious, decadent, butter-less coffee cake. so much so ..I’ll be sharing the recipe [and step-by-step pictures] on the blog next tuesday! peanut butter banana coffee cake. it pays to step outside of your comfort zone!